Samsung smartwatches run on the Tizen OS not Wear OS (formerly Android Wear), so the selection of apps is a bit different compared to Android watches. 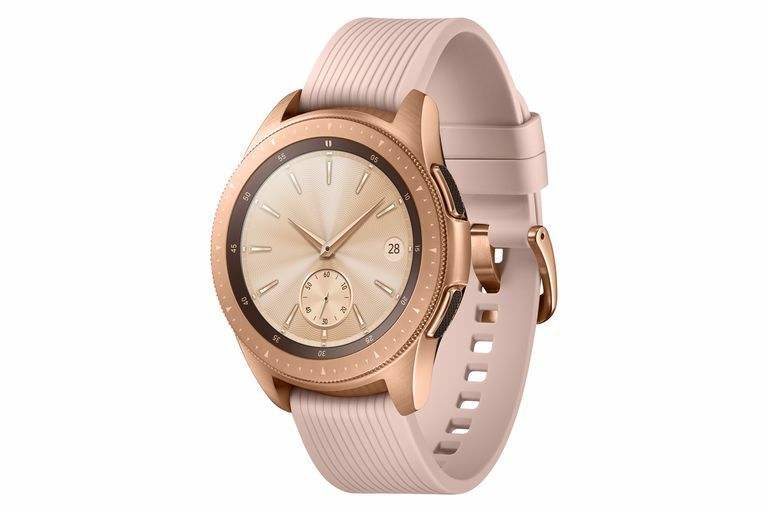 However, Samsung watches have access to the Tizen store and the Galaxy apps store, plus compatible apps from the Google Play Store. Apps-wise, the selection isn’t that far off from Wear OS with plenty of apps for alternative watch faces, fitness apps like MapMyRun, news apps like Flipboard, messaging apps like WhatsApp, music apps like Spotify, and much more. Here are the ten best apps for Samsung smartwatches. Has a lot of free features. Can continue conversations on a desktop. Have to convince your friends to get the app (though that shouldn't be hard). WhatsApp, owned by Facebook, is a free messaging app for mobile and desktop that has many convenient features. All messages have end-to-end encryption for utmost privacy, and it uses data to send messages, so you can communicate with people in other countries without paying for an international plan. It also has group messaging (up to 256 participants), free voice and video calls and even document sharing. Transit information for over 1000 cities. Voice-guided navigation is not available in all areas. HERE WeGo is a free navigation app with an array of features including offline maps and driving directions with traffic information. It also offers transit times and pricing, carsharing options and cost estimates, and biking and pedestrian directions. The app can even tell you key information about your route, such as how hilly your cycling route is. Can download songs to your phone and smartwatch. Great interface on watch screen. Non-premium users get limited song skips and intermittent ads. Spotify is a popular music streaming app, and the company collaborated with Samsung to make a Galaxy app, so it works perfectly with your devices. (It's available for download in via Galaxy Apps on your phone.) Premium users ($9.99 per month) get offline listening, plus you can offload downloaded songs to your SD card to save up space on the phone’s storage. Access to crowd-sourced running routes. Compatible with MyFitnessPal for nutrition-tracking. GPS tracking not always accurate. MapMyRun by MapMyFitness tracks hundreds of activities. You can even track gear, such as running shoes, so you know when it’s time for a new pair. The best feature is that you can map out your runs and share them in the app so others can see where it’s pedestrian-friendly. You can also see routes uploaded by others and verify that they’re up to date, including bike lanes, street closures, and construction. If you’re not into running, try out MapMyWalk. Can download workouts directly to your Gear smartwatch. The free version is pretty basic (though the premium option isn't very expensive). Pear puts interactive workouts on your wrist. You can use it to track activities or workout with Pear coaches. The app can even measure your heart rate and encourage you to keep going or slow down. Conveniently, you can sign up using your Samsung account, so you don't have to create yet another login. A Pear+ membership ($39.99 per year) gives you access to all of Pear's workouts and training plans. The free version includes three workouts. Compatible with a range of devices from Samsung and others. Can set up automated actions, such as turning the lights on at a certain time. Best if you have mostly Samsung devices. If you have smart home devices, such as kitchen appliances, thermostats, light bulbs, or garage door openers, the SmartThings app is a must-have. Compatible with tons of devices, the app lets you do things like turn on lights before you get home or open the garage when you pull into the driveway. Doing this from your watch is super convenient, especially if you’re driving. A broad range of topics available. Flipboard gives you news based on topics that interest you, from technology to humor to parenting to cute animals. To get started, you must choose at least half a dozen topics, but you can add or remove topics anytime. You also need to set up an account, either through email, Google or Facebook. Hundreds of watch faces available. Can easily swap between multiple faces. The app interface is a little busy. When you have a smartwatch, you can change and customize its face as often as you want. While Samsung watches come with some option, the Facer app has many more. Options range from simple (just the time) to dashboard style (time, temperature, steps, stopwatch, and more), plus there are plenty of fun ones, with pop art designs and holiday themes. You can also design and publish a watch face. Timer and stopwatch are good tools for on-the-go workouts. World clock includes live weather updates via The Weather Channel. Harder to hit snooze than on a regular alarm clock. While your smartphone and smartwatch can give you the current time, Samsung’s clock app includes an alarm clock, timer, stopwatch, and world clock. Set the alarm to vibrate for a gentle wake-up if you wear your watch at night or use the timer or stopwatch while working out. Finally, get the local time and weather for your favorite cities around the world, so you know what to pack on your next trip. A convenient way to make calculations on the sly. Unit conversion tool especially handy when traveling. Are calculator watches ever cool? Samsung’s calculator app is perfect for your wrist, whether you’re calculating the tip after a meal or need to add some figures on the go. You can also use it for unit conversion (tap the ruler icon) and see your history.